Got a cool $4.5 mill burning a hole in your pocket? You might just want to look at the latest solution in business travel mobility: A jet aircraft manufactured by Honda. Restaurateurs, entrepreneurs, and wealthy businesspeople around the country now have the opportunity to travel in style and comfort. 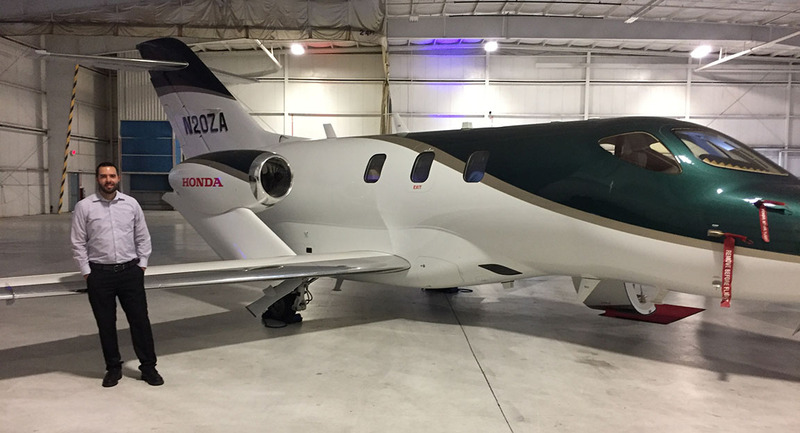 The increased work-life balance, improved productivity, and reduced stress thanks to avoiding delays, layovers, security lines, loud passengers, and seat assignments are big motivators that Honda hopes will drive customers to pick up its HA-420 aircraft. Plus, and here’s something I just learned, there are 398 airports in the United States with commercial airline service, but 3,052 airports that allow aircraft like the HondaJet to utilize. So it truly does open the door to being in multiple places in a shorter amount of time. “Welcome to your new corner office,” is the tagline for Honda’s foray into air travel which debuted in early 2016. 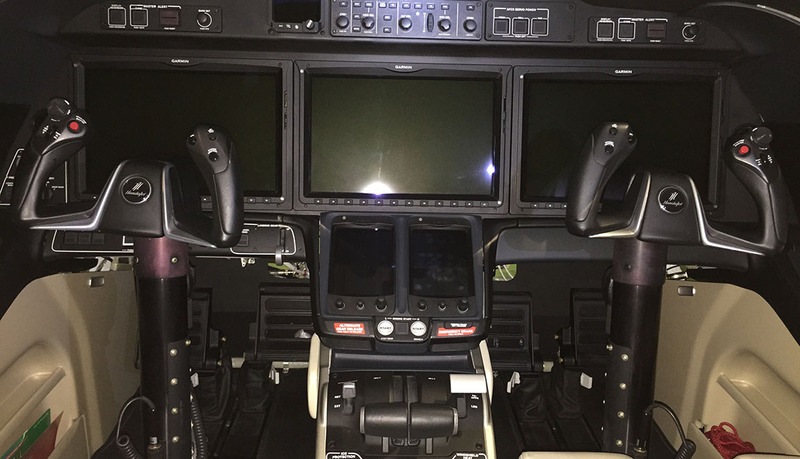 Just check out that cockpit! Technology for days. But does it have lane keeping assist, cruise control, or VTEC? While such a lofty purchase won’t be making its way into my humble fleet any time soon, it’s fun to dream. I had the opportunity at an event on Saturday night to get up close and personal with the HondaJet. Its fine leather and high tech almost made me wonder, “How come this thing isn’t called an AcuraJet instead?” It’s powered by the HF120 Turbofan motors, rated at 2,000-pound thrust-class with air start up to 25,000 feet, a 4.5 thrust/weight ratio, and 5,000 hours between overhaul. That’s all a foreign language to me, but it’s said to result in best-in-class durability and reduced operating costs, something we can all surely appreciate. 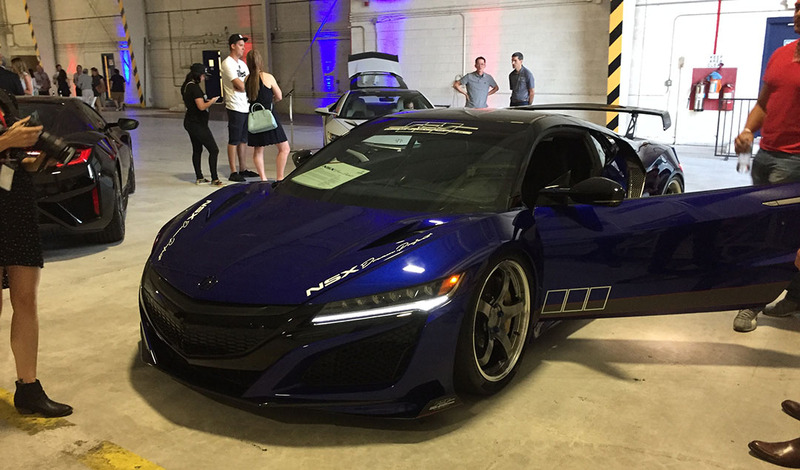 Also on display in the private hangar were the ScienceofSpeed-built, stunning Nouvelle Blue Pearl 2017 Acura NSX customized for this year’s SEMA trade show in Las Vegas by Chris Willson and his team from Chandler, Arizona. Ride-and-drive opportunities were made available on a first-come, first-served basis for attendees who wanted to take a lap around the block in Scottsdale’s Kierland area in a stock NSX. 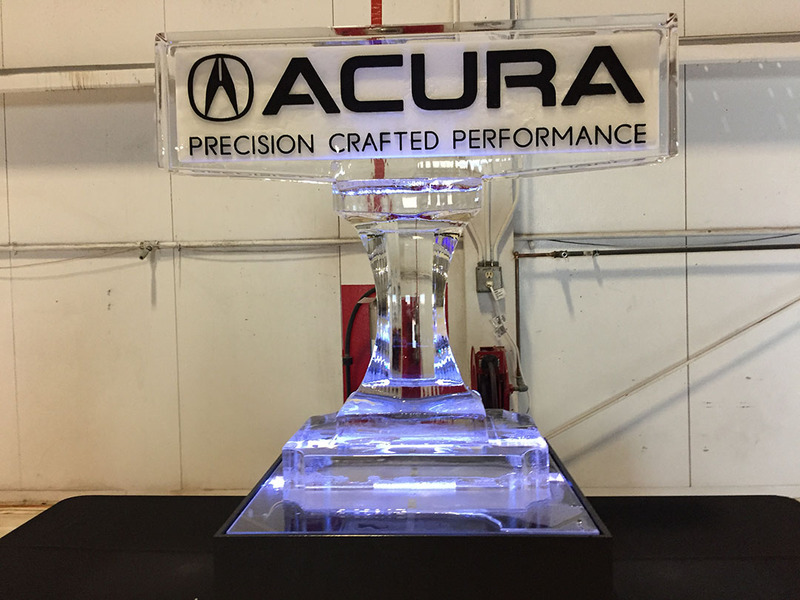 The event was a collaborative effort by Phoenix’s 3 area Acura dealerships (Peoria, Scottsdale, and Tempe). My friend Rob and I enjoyed hors d’oeuvres and beverages while having a look at the cars and chatting with other attendees. And the test-drive later that evening in a “Curva Red” 2017 NSX did not disappoint. The car drives, handles, and performs like nothing else I’ve ever driven. If I play my cards right, I’d like to get my hands on one for a full 7-day evaluation someday. I’ll be sure to bring you all along for the ride. 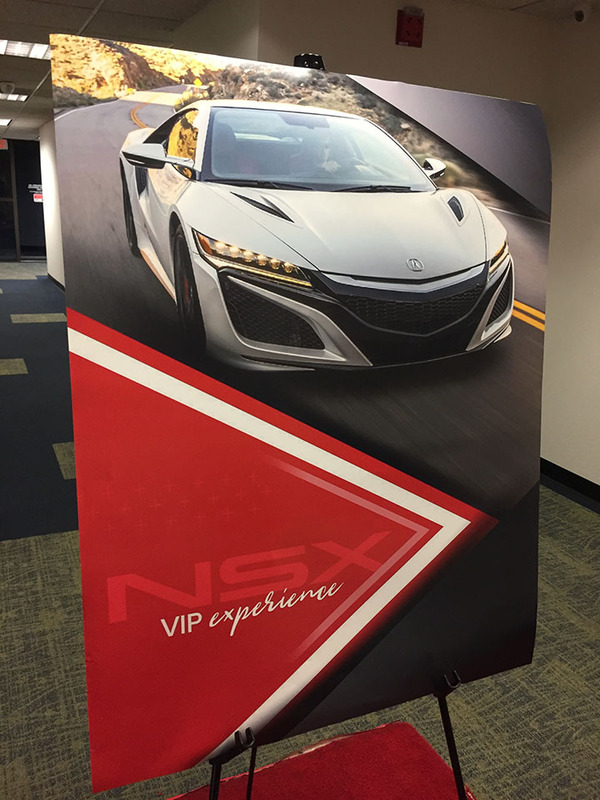 Premium parking for local NSX Club of America members was made available right in front. I drove my 1992 NSX, of course, and was one of several “Formula Red” owners in attendance at the program. Nice sunset overlooking the Scottsdale airport. Some of the night’s testers. 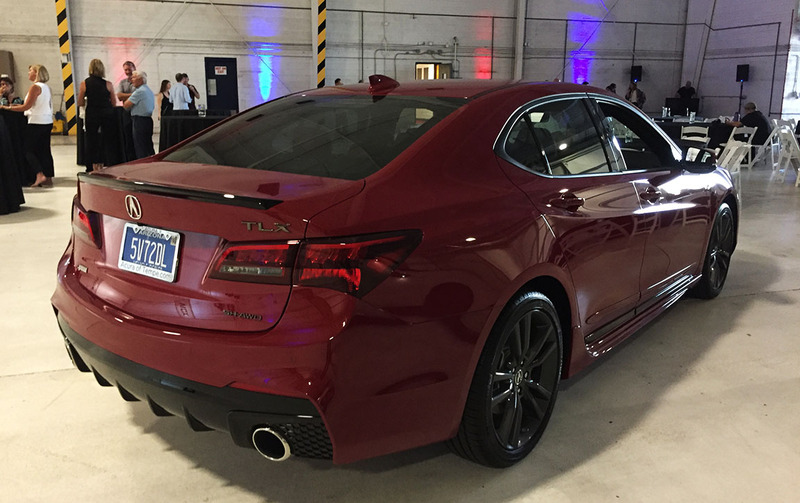 TLX A-Spec on display as well. I had my Legend GS sedan out and about yesterday to clean out some cobwebs. The car has a tendency to lose its battery charge over a few weeks’ time if not regularly started and driven, but purrs like a kitten once fired up. 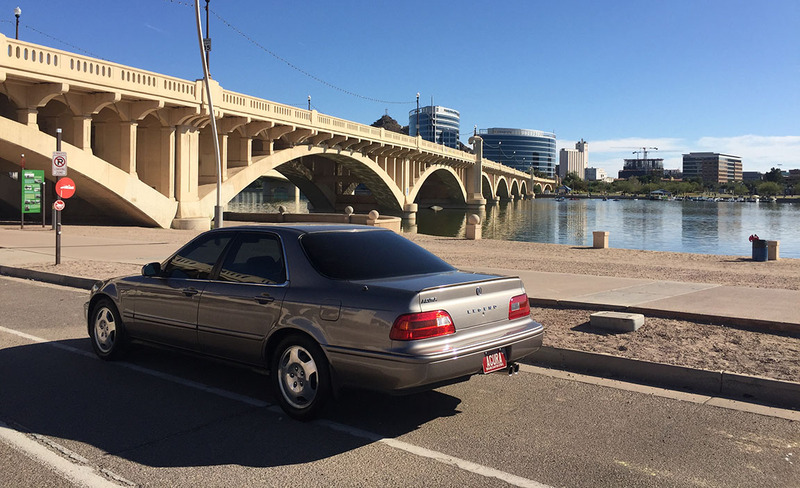 I drove over to the Tempe area for a snapshot at the Mill Avenue bridge. Temperatures were in the mid-80’s. 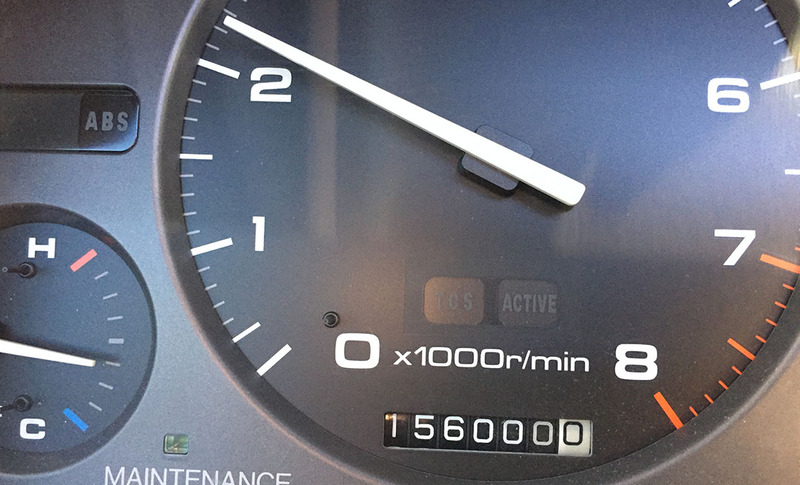 I celebrated a milestone on the way home. The sedan has almost exactly 400,000 fewer miles on it than the coupe. 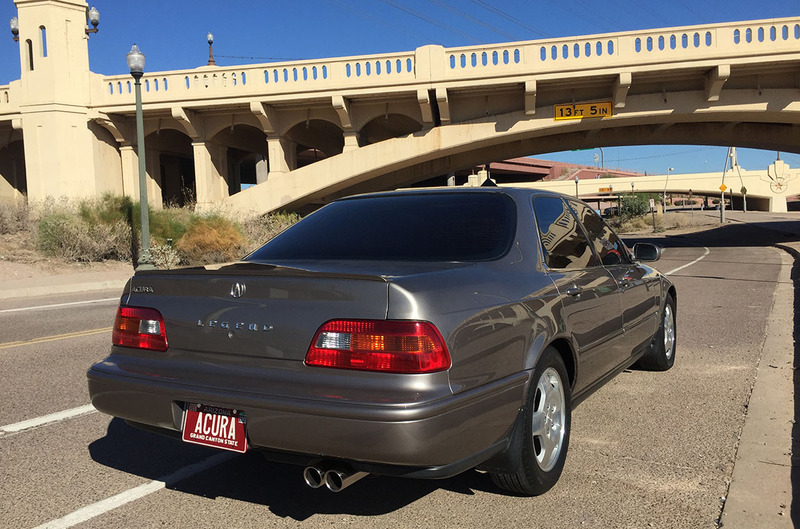 This entry was posted on November 12, 2017 at 11:03 am and is filed under Arizona, NSX. You can follow any responses to this entry through the RSS 2.0 feed. You can leave a response, or trackback from your own site. We should call up Davis and see if he could hook us up with a private experience in the HondaJet. Hmmmm I’ll work on buttering him up. Most certainly a day to remember! My dream is simply to drive the new NSX once. The jet is off limits for me … I can’t imagine an extension of my driving style into three dimensions (or rather I can). What is it with those Japanese batteries? They’re all the same…. Hey Pam! It’s good to hear from you and I hope things are well in Abbotsford. I take it you’re still enjoying the TSX and NSX. Here’s to hoping our paths cross in 2018. Maybe NSXPO in San Fran next September? Spending a week with the new NSX would be a pretty cool experience, here’s hoping that you can pull it off. I can’t ever see you using a HondaJet – you’d still end up driving to wherever you needed to go, ha! Cheers! You know me too well! That’s for sure. Even when I worked in the airline industry (2 years at a regional carrier called SkyWest, and 2 years at a mainline called US Airways) I rarely used the flight benefits! I was talking to my friend Kevin earlier this week. He flies on average about 70,000 miles per year. That’s about double my current annual driving distance. Very cool post. Envious of your seat time in the new NSX. I’ll keep my fingers crossed that you can score one for a prolonged test drive. I’d be eager to hear your in-depth thoughts on it. Aside from the battery thing, how is the sedan holding up? Lol @ the VTEC kicking in. I’m sure that plane would leave any of my cars in the dust if I raced it down a 1/4 mile racetrack! The sedan seems to be doing great. It’s by far my most comfortable highway cruiser now that the TL is gone. I have a car show coming up in Anaheim, CA the first weekend of December and have been debating about taking it but it’ll probably be the coupe or Vigor instead. Have a great work week! Someday, I’ll participate in posh NSX events like this with my own NSX. 🙂 Glad to see the Sedan out and about. Looking great as always. Love that thing. See you tomorrow! I’m sure Mazda people have events just as posh! I’m still waiting for you to do a professional, full-blown photoshoot with both of your Sixes. Looking forward to seeing you tomorrow evening! Reading through this post I couldn’t help wonder if a HondaJet costs $4.5m what about maintenance costs? I know. Everything about owning an aircraft is probably expensive. Imagine the registration, insurance, hangar rental fees, and any other taxes, on TOP of the maintenance! But hey, that’s the price you pay for convenience! Sometimes I sure dislike the “cattle call” feeling of commercial airline travel.